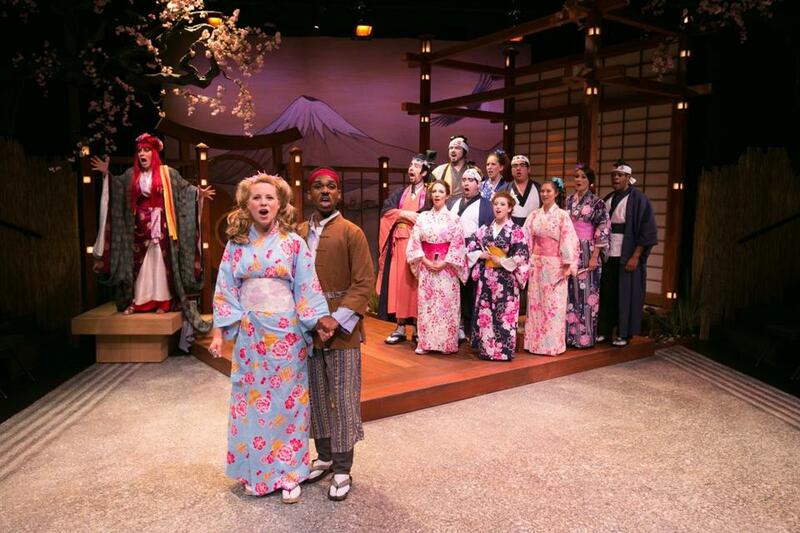 From left: Leigh Barrett, Erica Spyres, Davon S. Monroe, and the cast of “The Mikado” at Lyric Stage Company. The works of Gilbert and Sullivan are nothing if not durable, not to mention mutable. A couple of months ago, “The Pirates of Penzance’’ was turned into a freewheeling beach party in an adaptation by the Hypocrites, a Chicago-based troupe, at the American Repertory Theater’s performance space at Oberon. Now, with an eye and ear toward the current presidential campaign, Lyric Stage Company is offering an updated version of “The Mikado,’’ directed by Spiro Veloudos, that aims, with mixed results, to lampoon certain aspects of our political and cultural climate. It was hard to get a complete picture of the quality of the Lyric’s “Mikado’’ at Sunday afternoon’s performance, the first one open to the press, because a performer in a crucial role — Bob Jolly, who plays Ko-Ko, the Lord High Executioner — spoke and sang in a voice that was often reduced to a raspy croak. He gamely struggled through, and a Lyric spokesman said Monday that Jolly is expected to recover in time for Wednesday night’s show, but it greatly marred his performance from start to finish, including his rendition of “I’ve Got a Little List,’’ which was clearly designed to be a showpiece number of the Lyric production. That checklist of societal annoyances to be crossed off includes, in this contemporized version, “the Tea Party enthusiast,’’ the notorious private-parts tweeter Anthony Weiner (alluded to though not named), and, in a bipartisan swipe, “Politicians running hard who can’t seem to explain / What’s wrong with the economy or what they did at Bain.’’ Other topical references heard at various times in this “Mikado’’ — some clever, some not — range from Antonin Scalia to Wikipedia to the MBTA’s B Line to John Williams and the Boston Pops. What can be safely said is that the built-in charms of the 1885 comic opera remain intact and that the other lead performers — including Erica Spyres as Yum-Yum, Davron S. Monroe as Nanki-Poo, Leigh Barrett as Katisha, and Timothy John Smith as the Mikado of Japan — give sparkling performances. From its flimsy premise “The Mikado’’ flows amiably toward other implausibilities. Upon arriving in the town of Titipu, Nanki-Poo discovers that his beloved Yum-Yum is about to wed Ko-Ko. A former tailor who had been condemned to death for flirting, Ko-Ko experienced a welcome reversal of fortune that resulted in his appointment as Lord High Executioner. (See: Implausibilities, above). Ko-Ko’s chief adviser is the endlessly self-important Pooh-Bah (David Kravitz), a man of many, many titles, including, in the Lyric’s version, Secretary of Homeland Security and “Speaker of the House, both elected and indicted,’’ a jab at certain high-ranking Beacon Hill lawmakers of recent years. Ordered by the Mikado to carry out an execution, Ko-Ko makes a deal with Nanki-Poo, who is on the verge of suicide at the prospect of losing Yum-Yum: The young man can marry her for one month if he lets himself be put to death afterward. It all works out in the end, of course — even Katisha ends up happy — and it should all work out fine for the Lyric’s “Mikado,’’ too, once Jolly gets his voice back.